What the heck is the controversial Glass-Steagall Act? 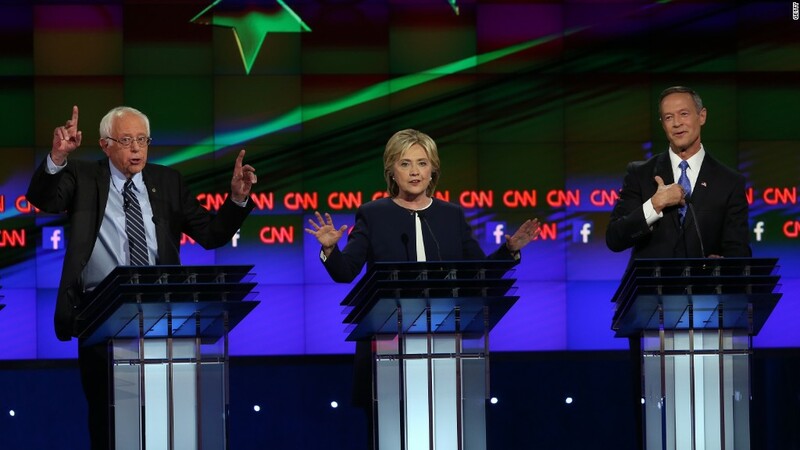 One of the hottest issues in the CNN Democratic debate was Wall Street. Bernie Sanders and Martin O'Malley want it reinstated. Then there's flip-flopper Lincoln Chafee. He voted to get rid of Glass-Steagall when he was a senator in 1999. Now he regrets it. "The Glass-Steagall was my very first vote. I'd just arrived, my dad had died in office, I was appointed to the office, it was my very first vote," he said Tuesday night. So what the heck is this controversial Glass-Steagall Act that was mentioned six times during the debate? CNN's Anderson Cooper gave the Cliffs Notes version: "Just for viewers at home who may not be reading up on this, Glass-Steagall is the Depression-era banking law repealed in 1999 that prevented commercial banks from engaging in investment banking and insurance activities." The law prevented banks like JPMorgan and Bank of America from dealing with both Main Street and Wall Street. Banks either had to cater to Main Street by taking deposits and doing mortgages and small business type loans or they could cater to Wall Street by buying and selling stocks and bonds or helping big companies merge. The thinking was that the Wall Street component of banking was too risky and would put regular Americans' savings and loans at risk. The law came into being after the stock market crash of 1929 and the Depression that followed. The official name of the law was the Banking Act of 1933, but it became known as Glass-Steagall because it was championed by Senator Carter Glass, a Virginia Democrat, and Congressman Henry Steagall, an Alabama Democrat and former Treasury secretary. The law was done away with in 1999 by Congress and President Bill Clinton. The reality was that many American banks were merging and forming bigger and bigger banks. Some were able to use a loophole in Glass-Steagall to to do both Main Street and Wall Street type banking. So Washington decided to level the playing field and formally get rid of many Glass-Steagall Act restrictions. The result was that more banks joined forces and got even bigger. Did it cause the financial crisis? There's a lot of debate about the role the repeal of Glass-Steagall played in the financial crisis. It's certainly true that banks got larger -- fast -- after 1999. That played into a Wall Street culture of excess, big bonuses and poor decision making. "Congress does not regulate Wall Street. Wall Street regulates Congress," Sanders said in the debate to much applause. However, when you look at the actual financial institution failures in 2008, Glass-Steagall probably wouldn't have made much, if any, difference. The first two large institutions to fail were Bear Stearns and Lehman Brothers, both of which only served Wall Street, not Main Street. In an oft-cited column, New York Times columnist Andrew Ross Sorkin goes point by point through how Glass-Steagall would have done nada to prevent the problems at Bear Stearns, Lehman Brothers, Merrill Lynch, AIG (AIG) or Fannie and Freddie or even Bank of America's acquisition of Countrywide Financial. Bill Clinton has also been on the defensive. "Look at all the grief I got for signing the bill that ended Glass-Steagall. There's not a single, solitary example that it had anything to do with the financial crash," he said earlier this year. Sanders, O'Malley and Senator Elizabeth Warren argue that the fundamental problem hasn't been resolved: they are still "too big to fail" and might need big bailouts from U.S. taxpayers again. Larger banks are also harder to regulate, which could be a recipe for another financial crisis. They believe big banks like JPMorgan Chase (JPM), Citigroup (C) and Bank of America (BAC) need to be broken up and the simplest way to do that is to bring back Glass-Steagall. "We need to separate the casino, speculative, mega-bank gambling that we have to insure with our money, from the commercial banking -- namely, reinstating Glass-Steagall," O'Malley said. 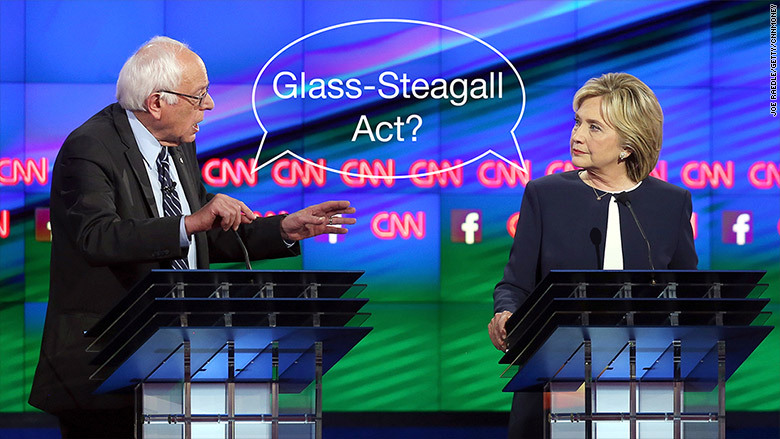 Clinton and the Republican candidates do not want to reinstate Glass-Steagall. Clinton argues that she isn't trying to be soft on the banks. But she thinks Glass-Steagall is too outdated and blunt of an instrument. "My plan is more comprehensive. And frankly, it's tougher," she said at the debate, adding: "If only you look at the big banks, you may be missing the forest for the trees." Her plan would increase regulation and oversight of the financial world and impose a "risk fee" on large banks with over $50 billion in assets. The financial world has evolved. It's not just big banks taking on risks. There are also hedge funds and other players that wouldn't fall under Glass-Steagall.